The mullet hairstyle is by far one of the most popular hairstyles in the world. Not only it is all business in the front and a party in the back, but honestly, if you were alive in the eighties, you probably had one of these hairstyles. In this day and age, there are so many different hairstyles available, it is no wonder that time is repeating itself and the hairstyle is slowly but surely coming back into style. The mullet is one of those hairstyles that are definitely popular in the southern states, but it has made its way to Hollywood as well. Britney Spears was actually married to a man with a mullet hairdo and while she and Kevin are no longer together, he is just one of the many celebrities that have picked up on the hairstyle and are sporting it everywhere! What a lot of people do not know about this style is that it is not just its catch phrase of ‘business in the front and party in the back‘; it is actually a very conservative hairstyle and certainly one that looks great on anyone. Usually, with this style, the sides are cropped very close and the back is left long while the top of the head has quite a bit of shorter hair on it. The back is mainly where you are going to do all of your stylings for this haircut. The possibilities are completely and totally endless when it comes to this incredible hairstyle, you can do everything from just a simple ponytail all the way to a rattail in the back. One of the more popular haircuts for the back of a mullet is going to be the ponytail. For a hairstyle that is as old as this one, there are definitely a few modern things that you can do with it. For maintenance, there really is no upkeep on it and there is certainly not a lot that you can do with it, which works for a lot of people. Maybe some braiding, maybe pull it into a ponytail or maybe add in some gel and you are definitely ready! The history of the mullet, contrary to popular belief, dates back to the 1960s when Tom Jones first sported the haircut. The cut is short in the front and long in the back. David Bowie wore it in the 1970’ and so did Paul McCartney. But it wasn’t until the 1980’s that the haircut really took hold. When you want to find out how to grow a mullet hairstyle, you’ll find many sources of information and advice. But, the best advice for growing this style is actually pretty simple. The mullet is really more than a hairstyle or cut, it is a lifestyle. People who have this style are often very unique individuals who do not travel the road most traveled. When you want to find out how to grow a mullet hair, you’ll find many sources of information and advice. But, the best advice for growing this style is actually pretty simple. It is really more than a hairstyle or cut, it is a lifestyle. People who have this style are often very unique individuals who do not travel the road most traveled. Deciding on the length of your style will be based on how fast your hair grows. If you have hair that grows quickly, then you may want a long mullet haircut. However, if your hair grows slowly, or gets frizzy easily, then you may want to think about a shorter, more controlled style. There are two ways to shape your mullet as it is reaching the length that you want. First, you can go to a salon and have your hair cut. The hairdresser will cut the top and sides of your hair short and leave the back long. As your hair grows, you will get regular trims at the top and sides until the back has reached the length that you want. Once your hair is the desired length, you’ll just go in regularly for an overall trim to keep it looking great. The other method is to let your hair grow the length that you want your mullet hair to be before you get it cut. Many people opt for this method because they don’t have that period when their hair doesn’t quite fit the style they are going for. When you decide to grow a mullet, you will also want to think about how to keep it looking good at all times. Mullets are hairstyles that require some attention. If you are not used to caring for your hair on a regular basis, you will want to talk to a person who has this style, or a professional, about the types of products and services that you will need to use to keep your hair looking well maintained. Florence Henderson even wore one in the iconic television series, The Brady Bunch, showing that the mullet is a style suitable for a man or a woman. The recent resurgence in the popularity of this hairstyle has left many people wondering how to get a mullet haircut. The mullet has been around for a long time as a hairstyle. Although it did not gain mass popularity until the 1980s, progressive stars such as David Bowie wore the style in the 1960s and 70s. Florence Henderson even wore one in the iconic television series, The Brady Bunch, showing that the said is a style suitable for a man or a woman. The recent resurgence in the popularity of this hairstyle has left many people wondering how to get a mullet haircut. By definition, it is simply a hairstyle that is cut short in front and on the sides while being left long in the back. There are two popular styles of mullet, the traditional and the ponytail. This haircut is considered suitable for business and blue-collar workers, though they may have to pull the back of the hair together to form a ponytail and tuck in under the collar. This is the origin of the term, ‘all business up front and a party in the rear’. To get a traditional mullet haircut, all one needs to do is have the barber cut the hair up front and on the sides to a short, traditional length and layer the hair in the back to a longer length, often covering the collar. The ponytail mullet was epitomized by country singer Billy Ray Cyrus in the early 90s. This cut featured a traditional cut up front and was left long in the back. The long hair could be put into a ponytail or left loose. Today, It’s not considered to be a mainstream haircut. It is often associated in a negative manner with fans of country music, heavy metal, and Australian rules football. However, many popular athletes and performers continue to wear a mullet. While getting a mullet haircut is relatively simple, maintaining it so that it remains a stylish look takes a bit more effort and the use of a small amount of gel to create some curl and hold it in place. One of the first “famous” mullet haircuts was seen on Billy Ray Cyrus back in the day when he was first gaining popularity with the country music scene. This style lasted well into the 1990s where we saw John Stamos sport it on the popular television show Full House. There are actually two most popular types of mullet hairstyles. The classic mullet haircut is one that is cut in a traditional style on the sides and top of the head. The hair around the ears is trimmed short, leaving the back of the hair long and layered. If you have natural curl, it will give the back layered look a very nice, wavy and thick textured look. If you have straight hair, the classic mullet will look as equally nice, having their hair tidy in the front and still keeping a long hairstyle in the back. The ponytail mullet is an ideal haircut for men who intend to wear their hair in a ponytail but have to maintain a formal look for their jobs. With the ponytail style, the front and sides are cut in a traditional way, leaving the back long. When put in a ponytail, preferably right at the occipital bone plane, the ponytail can be neatly tucked inside of a shirt and/or a suit. It is a very neat looking haircut, one with versatility and easy to take care of. Men with straight hair typically tend to do very well with the ponytail mullet, while men with a natural curl may have a more difficult time keeping their hair from looking “bushy” while in a ponytail. We’ve compiled hair 20 of the best mullet hairstyles for modern men to try right now. Messy bed hair is always a great look if you’re after something edgy and trendy – if you are wanting to take it up a notch then why not pair it with a mullet haircut too? Ideal for: Oblong, heart and diamond faces. How to Style: The key to this messy look is in the cut – the ragged bangs and choppy layers. To style simply run through with some wax and scrunch with your hands for that unkempt and disheveled look. This mullet hairstyle is also a modern and contemporary twist on a fauxhawk. Ideal for: Oval, oblong, triangle and round faces. How to Style: By keeping the center run of the hair longer and cropping the sides up as far as the temple, you can create this mullet-come-fauxhawk look. Running product through the lengths enables the hair to be styled up in that traditional hawk way. Some face shapes do not pair well with bangs or many volumes around the forehead, so this is a great alternative if you want a mullet hairdo but are worried about framing your face. Ideal for: Oval, oblong, triangle, square and round faces. How to Style: Side parts are perfect for those with oval, square, oblong and triangle faces. You can enhance the part by adding in elements like the shaved sides and longer sweeping top as well as some length around the nape. 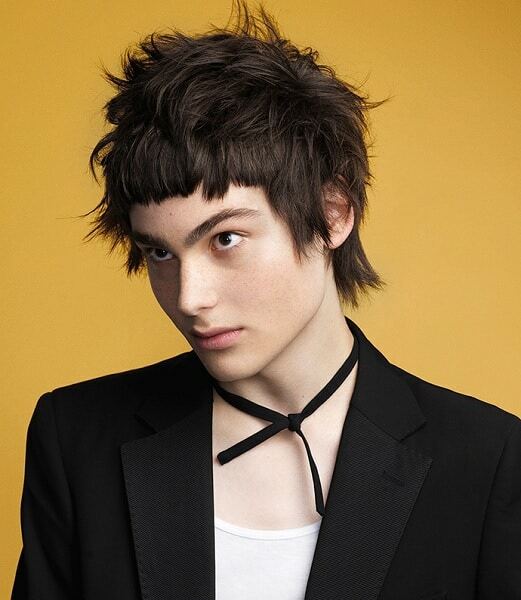 The hyper short bangs and longer back makes for a traditional mullet style but with a modern edge. Ideal for: Oval, square and round faces. How to Style: The baby bangs are a bold and distinctive style which won’t suit every face. This crop will work best for those with very straight hair that will benefit from the layering around the back and the tapered styling at the nape of the neck. Naturally, curly hair can be difficult to maintain but that doesn’t mean you have to settle for a conventional short style. Ideal for: Square and oblong faces. How to Style: A short crop across the top of the head makes this hair type much easier to maintain on a daily basis, however, the length around the nape of the neck gives it an edgy twist. Add some racing stripes to the temples if you really want to enhance this hairdo. This style maintains the overall silhouette of a mullet hair but done in a very contemporary and modern way. How to Style: Layering the hair here is key to this neat and suave look. Using a wax or serum the hair can be styled simply using your hands to create this layered look. If you want a mullet haircut but also want to retain your long hair, then this style is the best of both worlds. How to Style: Volume is a big must for this look so backcomb the hair at the roots for added lift and then set with a strong hold hairspray to achieve that high gloss sheen and precision look. If you want to unleash your inner punk, then a modern mullet hairdo is the way to do it! How to Style: The classic silhouette of the mullet is brought up to date and given an edgy twist with an asymmetrical fringe and spiked top. Use a straightening iron to achieve the poker straight look and, with a strong hold spray, use your fingers to shape the top of the hair into spikes. It can be difficult for those with super straight hair to find an edgy and cool style that suits their hair type. How to Style: Any style with layering is perfect for those who want to add volume and definition to their look. The short layers on top of the head enable the hair to be scrunch dried with mousse for a tousled style that contrasts perfectly with the straight bangs, sideburns, and length around the nape. Thick hair can limit some styles however this is a great example of a ‘do that is perfect for those with naturally bountiful locks. How to Style: By keeping the hair short on the sides it helps with the daily maintenance of thick hair. Blow drying the bangs backward with a round barrel brush can help achieve that sweeping and voluminous fringe. If you are wanting something a little more unique and edgy for your naturally curly / afro hair, then a modern mullet is a great option. How to Style: Your hair type will unlikely permit you to have a longer fringe portion here however you can still maintain some length at the back. The super cropped top is not only very trendy but will be much easier to manage day-to-day too! Sweeping fringes are great for people with long faces that need framing and pairing this look with a mullet hair makes for a unique and quirky style. How to Style: The hyper straight sweeping bangs contrast well with the slightly spiked and tousled top and naturally disheveled length at the nape. Not much daily styling is required here – run some pomade through the top of the hair to create some shape and use straighteners to keep that sweeping fringe in check. For those who like to rock a mohawk but want to change things up a little – this is a very edgy and unique choice. How to Style: Keep the length of your mohawk at the back for that trendy vibe but mix things up by cropping the hair along the top and the crown of the head short. If you have hyper long hair it doesn’t mean you can’t rock a trendy style. How to Style: This is a great way to add some definition and movement to straight and thin hair. Keep the full length at the rear of the head but add some interest by shaving the sides and cropping the top shorter with layers. This style really only works for those with straight hair fine hair and is a good way to add texture to otherwise a plain look. How to Style: The cropped and layered top of the hair is left natural, with the sideburns being immaculately cut for definition. The length at the nape is straightened into submission which provides a strong and trendy contrast. It is pretty obvious that the mullet hairstyle can really fit on any person and anyone. It is one of those hairstyles that everyone in the world can get away with wearing, no matter what gender or age you are! Mullets are awesome.I am a rebel from the south trhathas a mullet but someone tricked me into cutting,jackasses! Aƿpreciate the recommendation. Will try it out.